Dominic Eason will receive an undergraduate degree in civil and construction engineering this year. 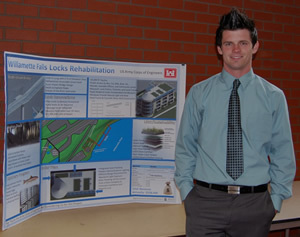 He served as project manager for his senior project, which explored possible routes to fiscal and environmental sustainability for the Willamette Falls Locks on the Willamette River at Oregon City, Ore.
Eason said that the locks, which are owned by the U.S. Army Corps of Engineers, are dilapidated and in need of funding since they no longer receive federal dollars. “Without the locks, which allow boats traveling up and downstream to pass the falls, water crafts would have to portage out and around with trucks,” Eason explained.